Surface active cleaning agent, for use in laboratory, medical and industrial automatic glassware washing machines. Biodegradable*, phosphate-free, Bactericidal**, non-foaming, non-flammable and free-rinsing. Colourless to pale amber, non-viscous liquid, having faint odour. A mixture of amphoteric surface active agents, non-phosphate detergent builders, alkalis and sequestering agents, in an aqueous base. 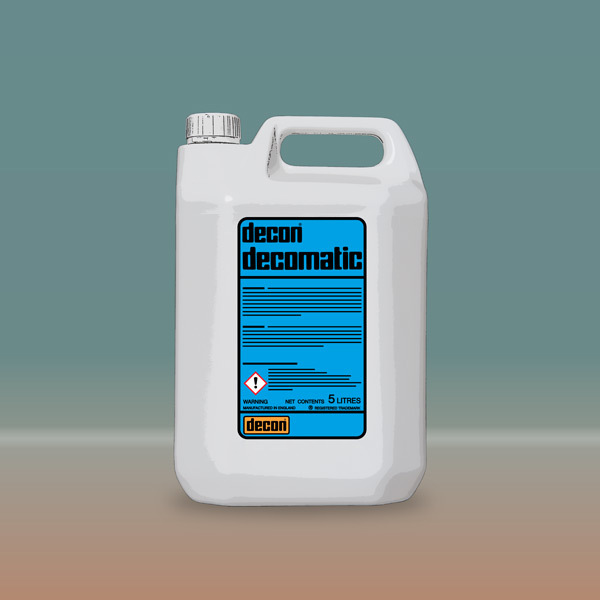 Decon DECOMATIC does NOT contain Phosphates, Enzymes, EDTA/NTA or Chlorine Bleaches. Supplied in 5 litre, 10 litre and 20 litre high density polyethylene containers, with "tamper-evident" screw-on caps. For machine cleaning and/or decontaminating glassware, ceramics, rubbers, plastics, stainless steel and ferrous metals. Being alkaline Decon DECOMATIC is NOT suitable for use on non-ferrous metals, notably aluminium and zinc or on polycarbonate. Please follow the manufacturer's instructions for your washing machine and place Decomatic into the appropriate chamber. Most washing machines use 45 to 60 litres of water in a complete cycle, which will require 80 to 120ml Decomatic, increasing to 200ml for very heavy soiling or problem contaminants. For fully automatic 'self-dosing' machines, insert the dip tube into the Decomatic container, following the machine manufacturer's instructions. ** decomatic satisfies the criteria in BS EN 1040 1997 for bacterial activity.